Day 5 is one of my favorites! 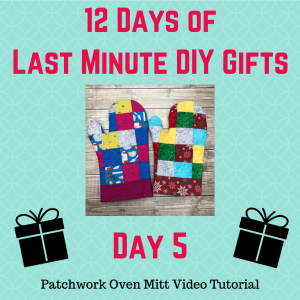 We are making Patchwork Oven Mitts and I’ve even included a FREE PDF template you can download here. It has a lot going on and it’s a longer tutorial but I include every single step you need to make a successful oven mitt. The star of this video is the fusible gridded interfacing! Wait until you see how easy this stuff makes sewing up a bunch of 2.5″ squares. You’re going to want to use it for a ton of stuff especially if you’re looking for ways to bust through your fabric scraps. This is perfect! FYI- We carry the grid interfacing in our shop here. Click to “buy” the FREE PDF download template HERE.